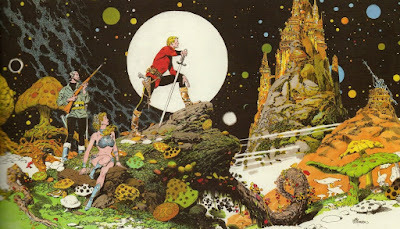 Precis: Dying Earth + He-man & Thundarr + Science Fantasy + Mythago Wood with boundaries stripped + all your favourite myths and stories from any era. In the far far future Earth, indeed the universe, is slowly dying. Man lives under a bloated red sun in the inherited ruins of former ages and the decadent nihilistic fatalism of the end times have set in long ago. Time itself is like a torn rag and the planetary memories of decrepit Mother Earth have long bled into the world without rhyme or reason, as Mother Earth hazily dreams half-remembered myths and long forgotten truths from its youth into the world again. The Fading Earth is chimerical, as if seen through a shamanistic dreamlike lens where truths and fiction are mixed without order, and reality often follows a more narrative than physical order. Facsimiles of the Knights of the Round Table ride out of the mist in a crusade against the Old Ones stirring as the end of time approaches. Archetypical elves stalk the dark woods (or peddle yellow lotus weed in the city, struggling with the existential crisis of a race resurrected out of time in a world where little matters anymore). Atomic age science-fantasy wizards manipulate cosmic matrixes in their towers, Thor requires company to explore a titanic ancient generation starship arc, Mi-go conduct ancient star rituals and trolls sleep under bridges. All myths are potentially right here. And all past events potentially here too. As dreams of a dying earth, they appear without rhyme and reason as caleidoscopic re-interpretations of the past. For those who haven't read it, Mythago Wood is a fantasy novel from the 80s. It's about a guy who explores an old forest that acts as a kind of receptable for the racial consciousness and memory of mankind, storing archetypical jungian myths from now to way back to the ice age and incarnating them inside the woodland (robin hood, king Arthur, etc. but often not quite the memories we have of them today, although these also play a part). I found it a very inspiring way to look at fantasy and thought "what if the earth has it's own storehouse consciousness where it remembers all the myths, stories and real events that sapients have been sufficiently conscious of over time?" And then fast forward to a Dying Earth setting where this Gaia consciousness has grown senile and, rather than just storing it, has started replaying its old memories, or facsimiles of them (it is senile after all), as actual incarnated and embodied places and people on earth, without regard for what was history, history embellished with myth or just plain fiction. Post-apocalyptic fantasy future-earth with just about anything from earth history, myth and fiction you want in it. I think this could make for a fun setting for D&D. Some parts of the setting might be stable and 'ordinary' (or at least, ordinary by the standards of the future fantasy dying earth) - separated by vast stretches of mythland (and also dotted by pockets of mythlands) where the dreams of the Fading Earth have taken hold - where Alice in Wonderland Reimagined is as likely to show up as the historical figure of Casanova.